The DC Youth and Investment Trust Corporation played a vital role in the success of the District of Columbia Housing Authority (DCHA) summer initiatives. Early this summer, DCHA held its third annual basketball tournament, the majority of funding came from the Trust. Throughout the summer, Trust-funded activities have been ongoing at more than 10 different DCHA properties, providing college-age youth with necessary employment and providing residents of all ages vital programming and information. As part of the One City Summer Initiative, the Trust gave mini-grants to fund a wide range of programs and events; and hired 19 Young Adult Coordinators (YACs) to help coordinate programming and outreach at participating DCHA sites. This isn’t just a traditional summer job, all coordinators are high school graduates from DC, and most are either currently working towards or have already earned a bachelor’s degree. Their responsibilities are to assist and supervise the kids in the younger youth and young adult programs, and ensure that providers for the workforce and family programs have everything they need. They also have been helping connect residents to services from government agencies like the Department of Health, DC Public Library, and the Office for the State Superintendent for Education. To ensure success at the properties, the Trust mixed up their funding between a combination of new programs as well as existing programs. The L. A. Russell Group, Inc., pioneered the Fashionista Entrepreneur Academy at Sursum Corda, and the young ladies in the program have really enjoyed their summer. Beautiful U Yes U Founder and Executive Director Tre'ona Kelty started her outreach with young ladies at Benning Terrace, and then she grew to include programs for adults as well. Additional funding allowed her to extend services to Woodland Terrace, and her program is doing quite well at the additional location. The YACs spend their Fridays meeting with Rebecca Renard, Director of Strategic Initiatives for the DC Children and Youth Investment Trust Corporation; discussing their weeks, and what challenges and victories they’ve had. These meetings allow the YACs to learn from one another through shared experiences. The YACs also provide feedback as to what works on the properties, what might need to be changed and what the participants—especially the youth—aren’t responding to. 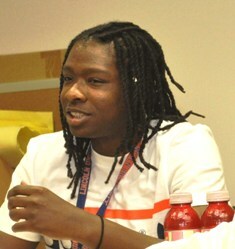 Earnest Jackson is one of two YACs working at Benning Terrace. When discussing his experience on the property, Jackson said he knew his role was important when he heard one of the youth he was working with say, “I don’t know how to tie a tie but I can roll a j (joint).” Jackson, who is not a Benning Terrace resident but lives adjacent to the property, said this program is especially good for the younger kids, because they aren’t used to seeing people like the YACs, that really have their best interests in mind without an agenda. Programs, partners and residents flourished during the summer months. There is the hope that some of them may even become year-round programs and for others, that they might at least become as standard as the summer itself. Earnest Jackson, rising sophomore at Lincoln University in Pennsylvania, recognizes the responsibility of his job. “Younger people won't always listen to older people, but they will consider things when they hear it from people in their same age group,” he said.